They’ve been around the block for some time now and they can be played from anywhere, as long as you have an Internet connection and a browser. Browser games of the persistent type take months to finish or don’t end at all. ImperialAges.com is such a game. It’s a strategy game set in the medieval ages, that can be played with only a browser. It restarts every 12 months and there is always a server open for new registrations. 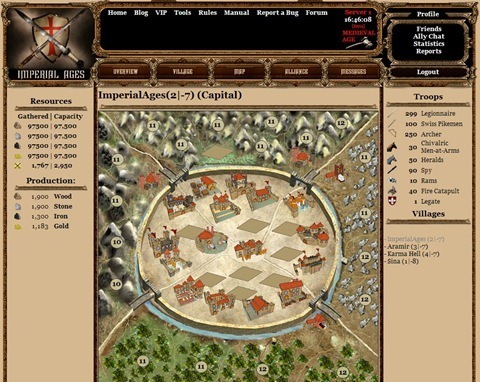 Imperial Ages is a persistent browser-based game (PBBG), set in the Medieval Ages. You only need a browser and an Internet connection to play it, and you can train or fight against 120 types of military units, from 4 different civilizations. Nice game . I really enjoy playing it while I check my email and such .